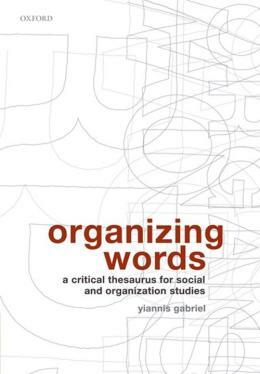 Organizing Words presents a series of essays on some 220 widely used--and much debated--terms in the social sciences, and organization studies. Each essay explores the meanings and uses of the word; and also the controversies they have sparked. The book aims to be a first port of call for students, researchers and scholars who wish to familiarize themselves with these key ideas and use them in their own work. The book is neither an encyclopaedia nor a dictionary, but a thesaurus. As such it combines both the original meaning of a thesaurus as a treasure trove, with its more contemporary characteristics of an accessible and practical resource. Primarily aimed to those interested in social and organizational studies, it will appeal to all those interested in the human sciences. It does not claim to be canonical or all-inclusive, but each entry seeks to enlighten and help, without patronizing or obscuring disagreements and difficulties. The book seeks to be re-assuring without being complacent or "comfortable", to be authoritative without being doctrinaire, and to be critical without being destructive.